REEDSVILLE — Students from Eastern Middle School joined others from around the region on Saturday taking part in the regional Science Olympiad competition at Marietta College. The competition marked the first time the school had sent a full team to compete in the event, after sending individuals the past few years. Science Olympiad began five years ago at Eastern Middle School and has grown each year to the point where the school can now send two teams. Eastern sent two teams of 15 students each to the competition, taking second and third place in the team event. Teams compete in 23 events as part of the competition, with teams of two students taking part in each event. Some participants competed in as many as four events during the one-day competition. Overall, Eastern Team 1 took second place, with Eastern Team 2 taking third. Warren was the overall winner, with New Lexington placing fourth, followed by Southern. 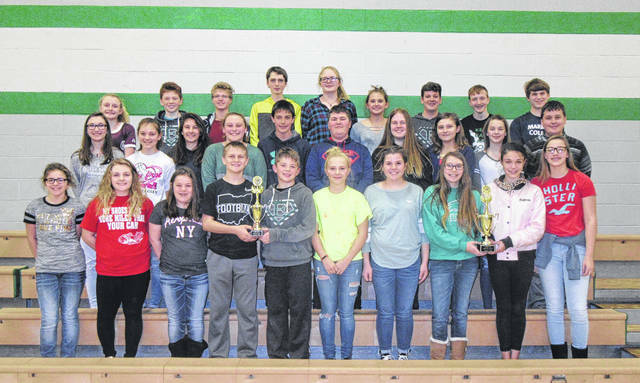 “We are really proud of our kids,” said Middle School Principal Bill Francis, noting that it was good for the school to bring home an academic honor with the two trophies. The trophies have been placed in the school’s trophy case alongside several athletic trophies and other honors. The top four teams from the regional competition advance on to the state Science Olympiad event in April at Ohio State University, but each school can only send one team to compete explained Krista Johnson, middle school science teacher who organizes the team. With Eastern only able to send one team, Southern will also advance to the state competition. Johnson and Middle School Principal Bill Francis explained that rather than just sending one of the teams to the state event the students are being combined into a single team which is being narrowed down to 15 participants and five alternates. Students are being selected based on first place finish at the regional event, as well as other criteria to determine the participants in specific events. All members from both teams will be able to attend the state competition with the team even if they are not participating in a specific event. “Science Olympiad is awesome,” said Bryce Newland of the event. “We got to build and compete,” added Newland as he prepared to send his “Battery Buggy” across the gym floor. “Science Olympiad is a great learning experience for something we are typically not exposed to,” said Emma Epling. Epling added that the students have learned a lot though the program and competition, crediting their teacher for her help in making the students successful. “The satisfaction of going to state. There is something very awesome about that,” said Newland. Events are science based, and include lab activities, building projects and test questions on a range of topics. Write It Do It — Olivia Harris and Emma Epling. Team 1 participants were Megan Maxon, Baylee Haggy, Cami Jones, Olivia Harris, Emma Epling, Lane Barber, Isaiah Reed, Ethan Short, Jacob Spencer, Jayden Evans, Breanna Nelson, Savannah Barnes, Lilly Suttle, Koen Sellers and Jaylin Stevens. Team 2 participants were Bryce Newland, Riley Pierce, Ryan Ross, Malachi Martindale, Abby Bauerbach, Tessa Coates, Trent Morrissey, Colton McDaniel, Lindsie Davis, Emma Doczi, Ella Carleton, Juli Durst, Hayley Sanders, Kyra Zuspan and Kendyl Householder. The students will take part in the state competition on April 28.